With raw cacao, a mixture of nuts and seeds, coconut and cherries, this Dark Chocolate Cherry Buckwheat Granola is the perfect excuse to eat chocolate for breakfast. But who am I kidding? I don’t need an excuse. This dark chocolate cherry buckwheat granola appeals to my inner child. Chocolate for breakfast is like jumping in puddles wearing your best clothes or twirling in the grass until you can’t stand. It is a little bit of bliss. Every morning I put on my big girl shoes and do big girl things like laundry, shopping, making sure little people don’t play in traffic…the only time I allow myself some small person time is when I’m with my small person. The Elf and I jump in puddles and twirl until we drop, we throw leaves at each other and chase the dog. All the while my adult self is calculating allowable play time in order to get dinner on the table and the Elf in to her bath. It’s calculating pi and not the good pie. While my big girl shoes pinch sometimes, I am so utterly grateful that I get to watch the Elf become the person she is becoming. I witness her wonder, hear her musings and glimpse in to her world of imagination and joy. I just have to remember to allow myself some measure of that same freedom; to succumb to joy without judgment or timetables. And so, sans judgment, I am having chocolate for breakfast and this dark chocolate cherry buckwheat granola is big girl chocolate. With healthy buckwheat, cacao, coconut, nuts and seeds it does my body good but it’s the deep chocolate flavour that has me smiling. 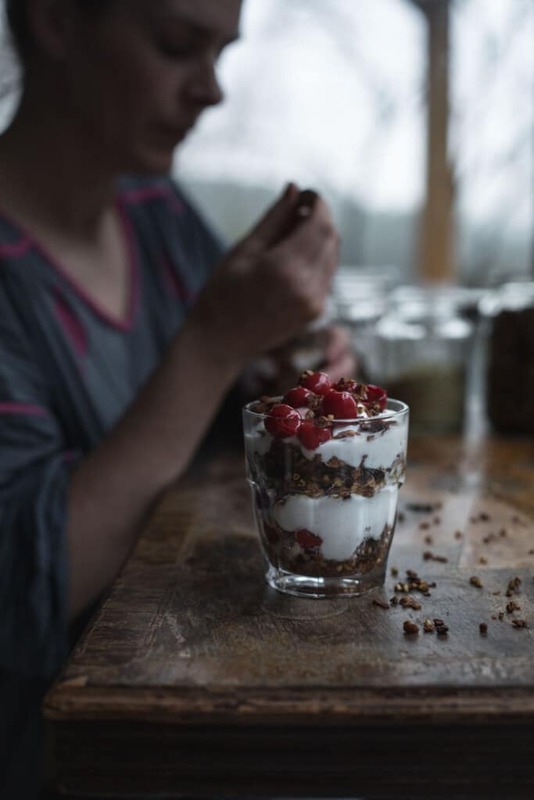 Buckwheat is one of my favourite things to cook with and buckwheat granola is one of my favourite things to cook with it. 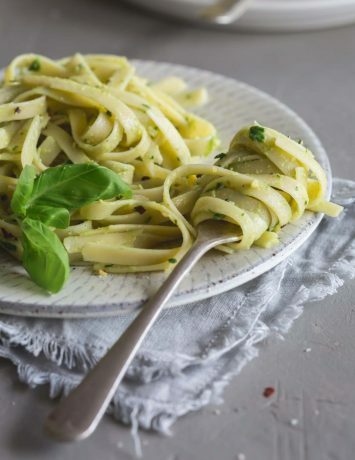 This under-appreciated little nugget is super cheap, versatile and a nutritional powerhouse. And it’s gluten-free despite its name. While commonly mistaken for a grain, buckwheat is actually the seed of a broadleaf plant related to rhubarb and sorrel. 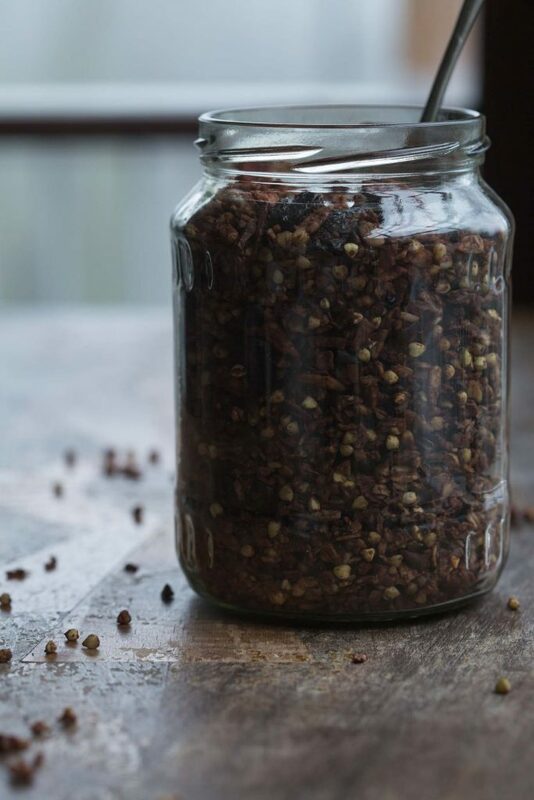 Raw buckwheat kernels are called groats – such a funny word – and if they are not in your regular cooking rotation, you are missing out. Buckwheat is awesome whether in a risotto or vegetable fritters or, as today, a completely wonderful buckwheat granola. Bringing together dark chocolate, fragrant coconut and tart cherries, this granola is a delicious exercise in decadence. And it’s good for you. Go figure. While you could serve it simply with almond milk or a smattering of fruit, my inner child screams for a breakfast sundae. 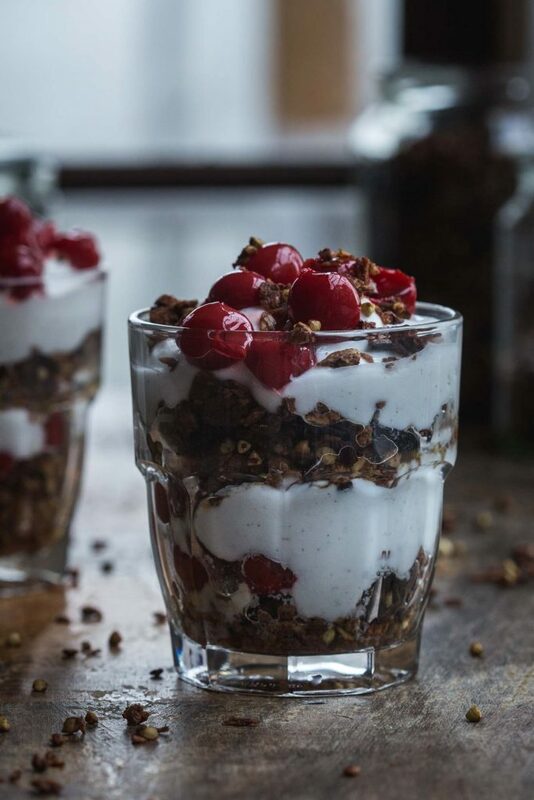 Layers of crunchy chocolate granola nestled within swirls of coconut yoghurt and juicy cherries bring whimsy and joy to my breakfast table. It is such a lovely way to start the day. Yes, there will be more laundry, more shopping and dodging of cars but in this moment there is chocolate for breakfast. And one of the perks of being an adult is that I didn’t need permission. Win. 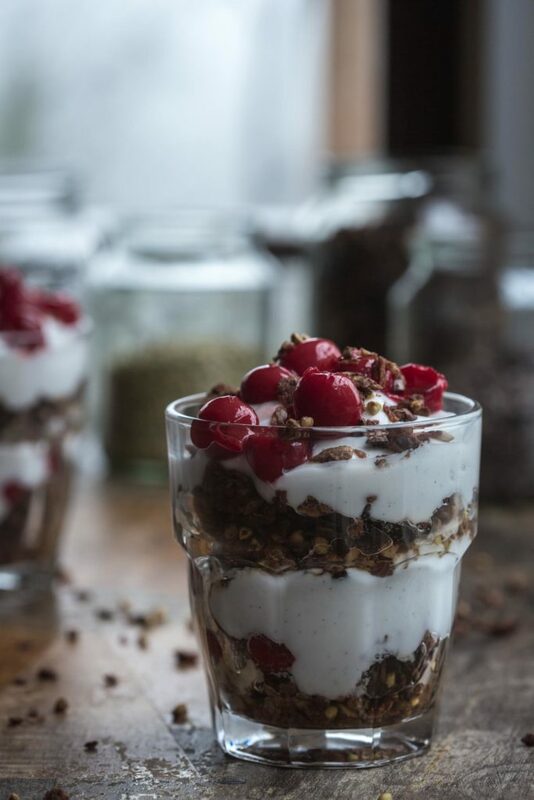 With raw cacao, mixed nuts and seeds, coconut and cherries this Dark Chocolate Cherry Buckwheat Granola a lovely excuse to eat chocolate for breakfast. Preheat oven to 170 degrees C and line a large roasting or baking tray with baking paper. Drain and rinse the buckwheat groats and place in a large mixing bowl. Place the oats, sunflower seeds, pecans, cacao, sugar and coconut in a food processor and pulse briefly to combine. Add the mixture to the buckwheat and set aside. In a small saucepan, melt the coconut oil and coconut or maple syrup together, whisking. When fully melted and combined, carefully add the mixture to the buckwheat and stir through to coat the granola evenly. Spread the mix out on to the baking tray and place in the oven for 20 minutes. Remove from the oven and gently turn the granola with a spatula or spoon. Return to the oven for another 20 minutes before removing. 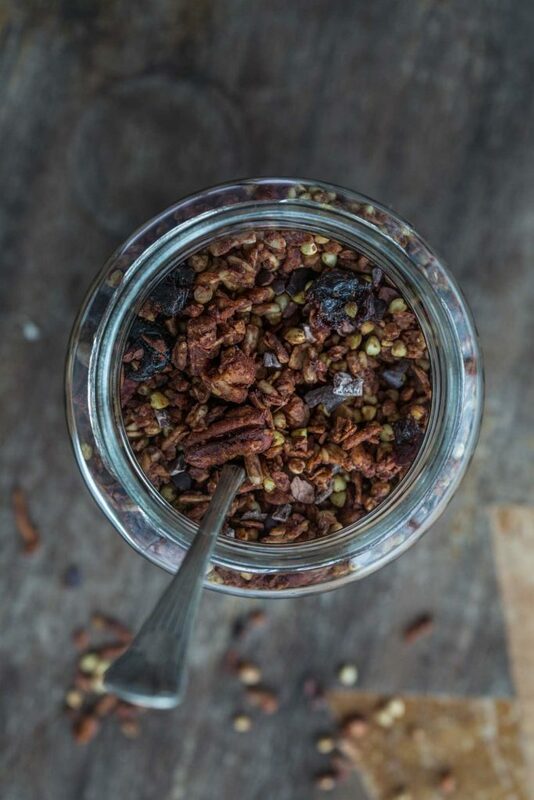 Stir through the cacao nibs or chocolate and the dried cherries and allow the granola to cool completely. The mixture will crunch up as it cools. Serve with almond milk or with coconut yoghurt and cherries. Oh gosh I definitely give myself permission to eat this. Yum! 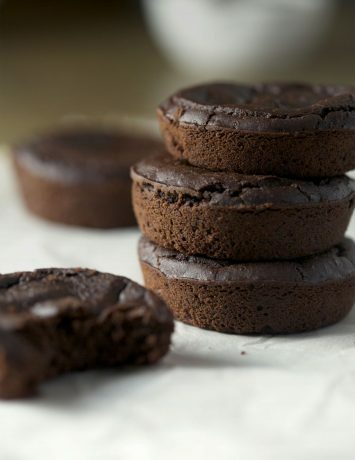 One day we will meet over chocolate at breakfast time. x Thanks Michelle.